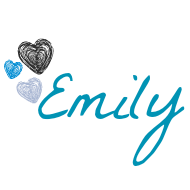 Before I jump into Easy steps to customize bookshelves for a custom look I am going to get a little personal. Today my youngest child, my littlest little Gavin is 6 years old! It is fine, I am fine… I’m not crying, you’re crying! Guys, seriously where does the time go? I had my tiny squishy baby in my arm and now he is a 6 year old, I blinked and he is big! I am uncomfortably aware that my time with my kids being little is flying by, I now have a 9, 7 and 6 year old in my home. Every single season in life is temporary and our kids growing up is the biggest example of time flying by. My home is for me, but is so much for my trio of littles right now, this is where they grow up and will create those sweet childhood memories. No pressure right? Alright, now that I have gone all Mommy status on you let’s get back to the task at hand. 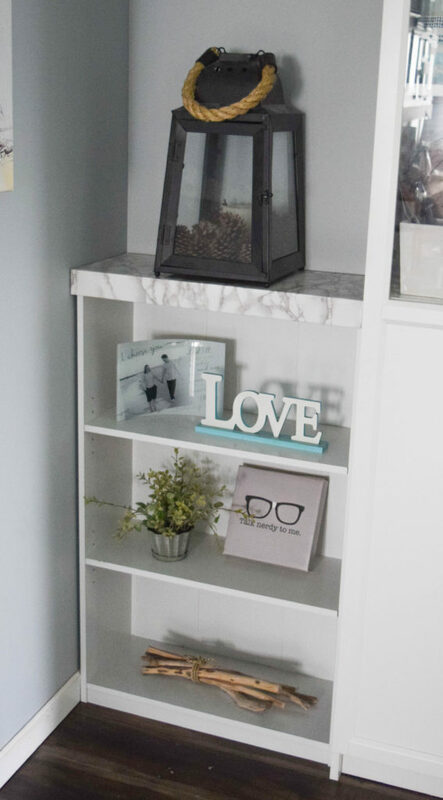 I am sharing easy steps to customize bookshelves for a custom look and it is sooo crazy simple to do this. Here is what my dining room has looked like for a while. I shared the full reveal earlier this week, which can be seen here. 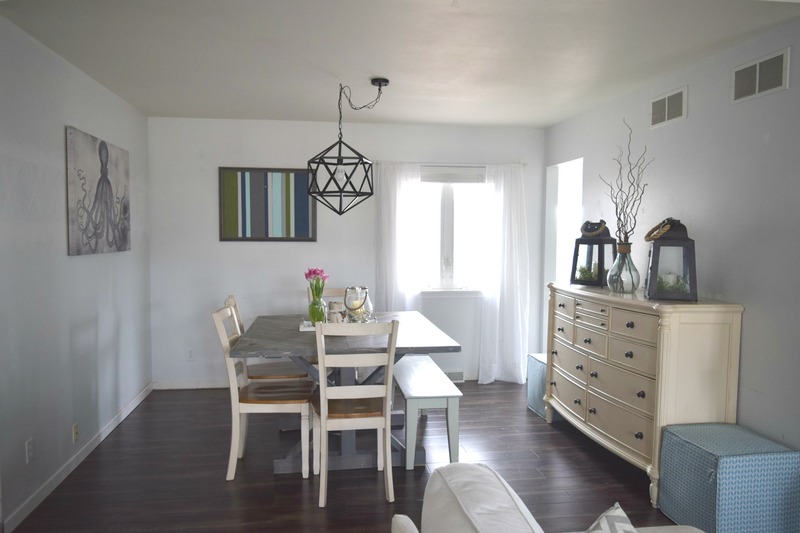 I gave the pretty reveal pictures, explaining how I made this room finally work in terms of furniture layout. What I did not share if the details on the cabinet. 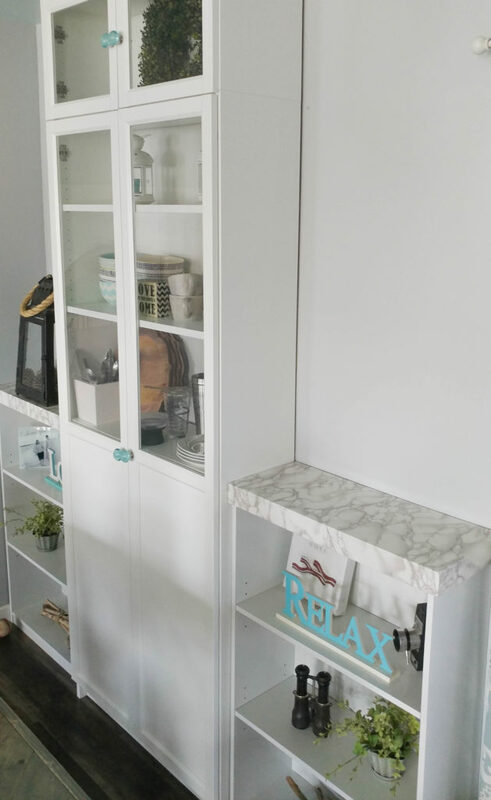 I took a few store bought book shelves and turned them into pretty custom cabinets! 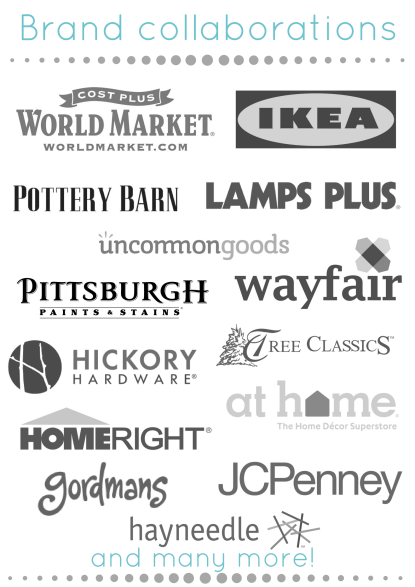 I will be sharing a list of shopping items in case you want to purchase these same items. 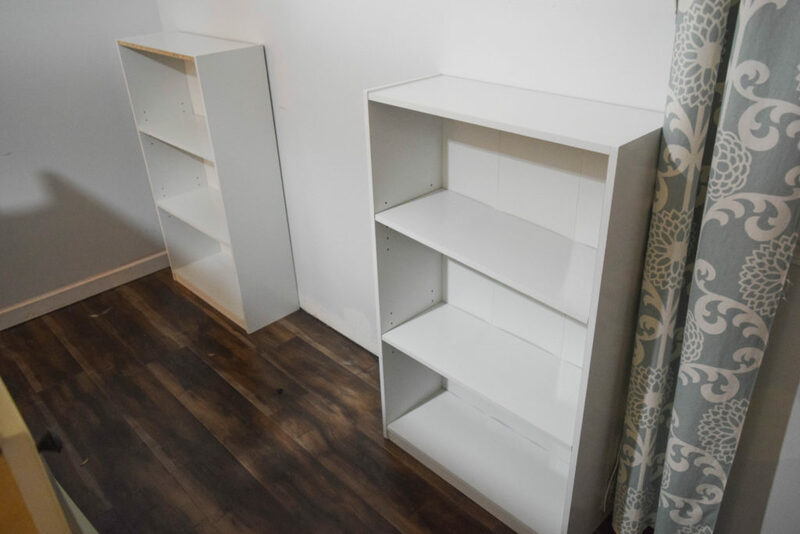 I purchased two white bookcases, they are 4 ft tall. I also purchased one large white cabinet with glass doors. This goes from floor to ceiling. 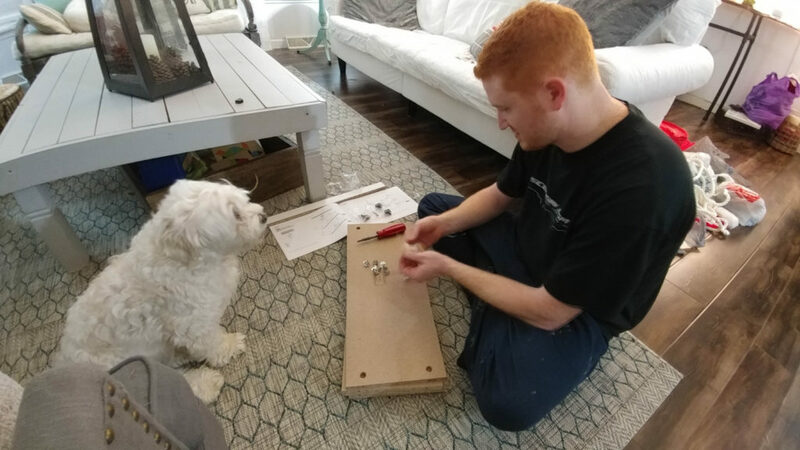 Some assembly, and a crew of helpers were needed. Here is Dale with a little help from our furry friend Teddy. 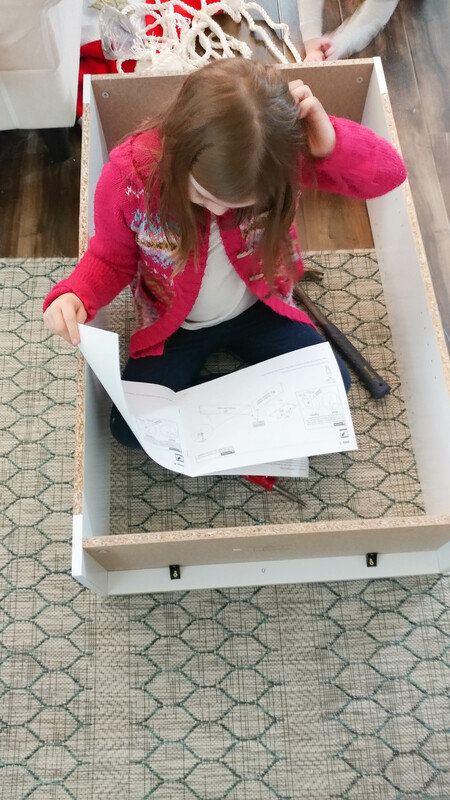 Nora got to work trying to decipher the instructions. 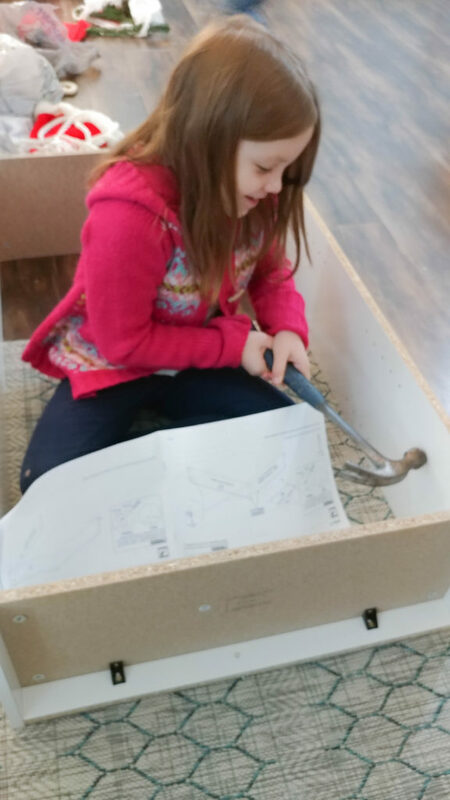 When we DIY now it has become a family affair. Each of my kids have different level of interest, but my daughter Nora is right there with me through it all. The girl loves to decorate! Put together! We have two bookshelves, yay for team work! With the tall cabinet in the center this adds so much storage space to my home. Which, with any family is always a good thing. With the off center window in the dining room this taller cabinet with the glass windows balances out the wonky window situation. I have heard that people are considered more attractive with a symmetrical face. My dining room is very unsymmetrical, so I guess it is not that most attractive. Hopefully this little mini facelift will help out the issue. Here is where the custom aspect of the project comes in. I wanted the two bookshelves to fit in with a dining room. Seem like an extension of the kitchen, so my plan is to bulk up the top of these and add a marble counter top. Since a real marble slab is not in the budget right now, and this is all technically temporary I am actually using marble contact paper for this! 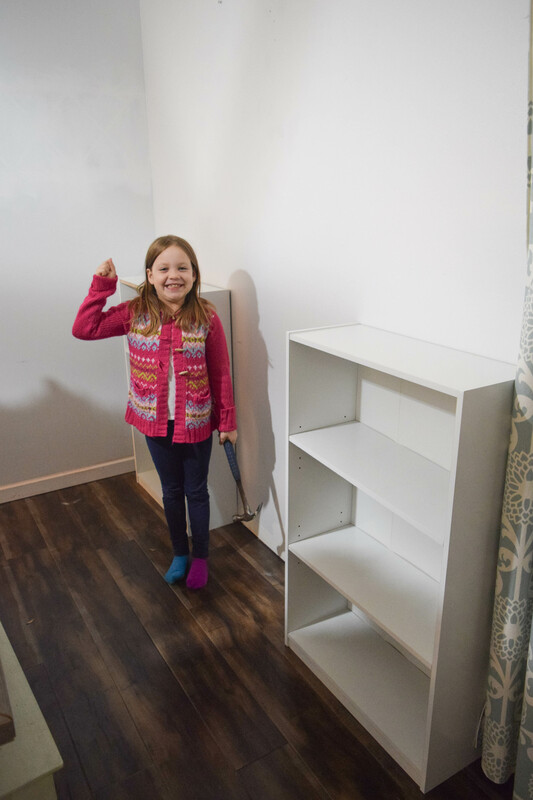 The end goal is to build legit custom built-in china cabinet with actual counter tops, but that is a ways off and the wonky dining room needs to be remedied now… not later! There is a few instances in life when bulk or adding chunkiness in a good thing, babies, chunky babies are always the best. The other one is typically in home decor. I am bulking up the top of the bookshelf. 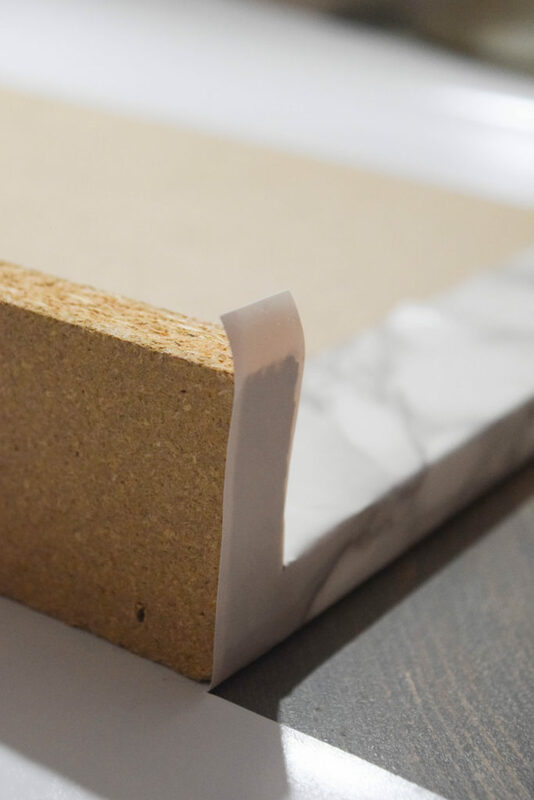 I did this by using MDF board, it is a really low cost option for projects like this. 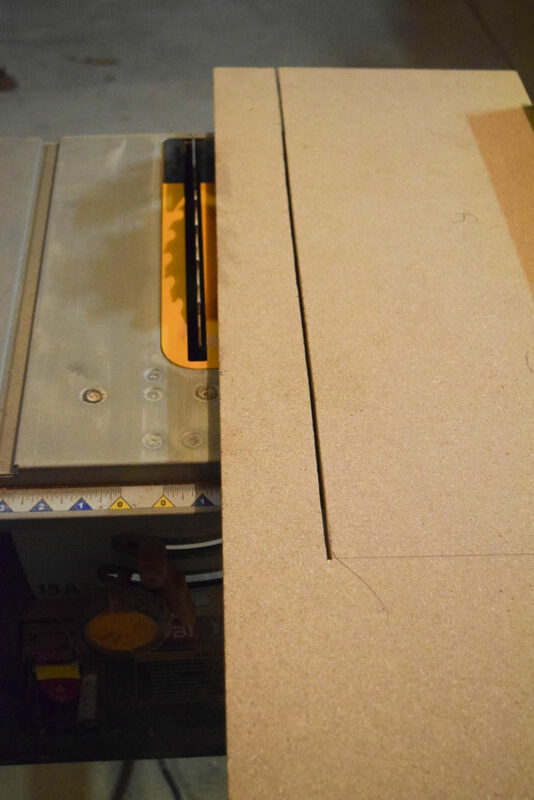 I measured the bookshelf top. The plan is to have this with a slight overhang, so I went over about 2 inches on the sides for this reason. 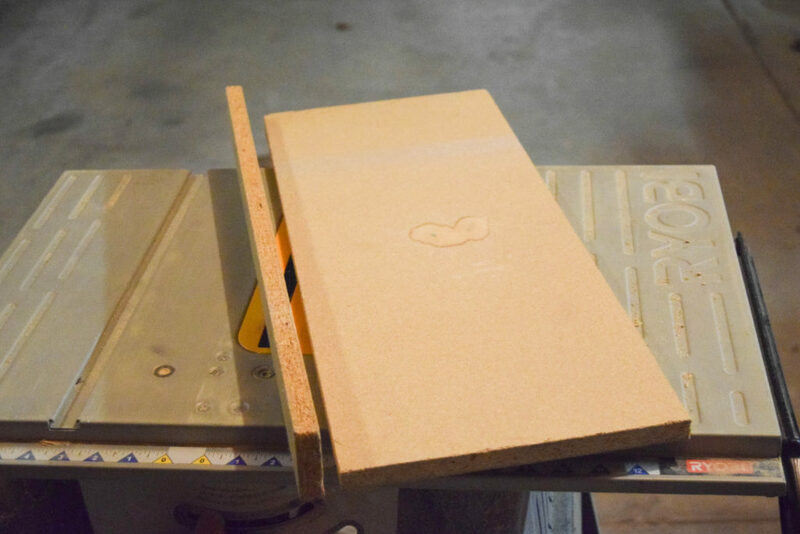 Marking it all then cutting with a table saw. Yay for power tools! I cut 3 inch wide side pieces. This is what will actually add the bulk to the furniture piece. It will help give the illusion of a marble slab. These are actually not attached in anyway to the top of the bookshelf. 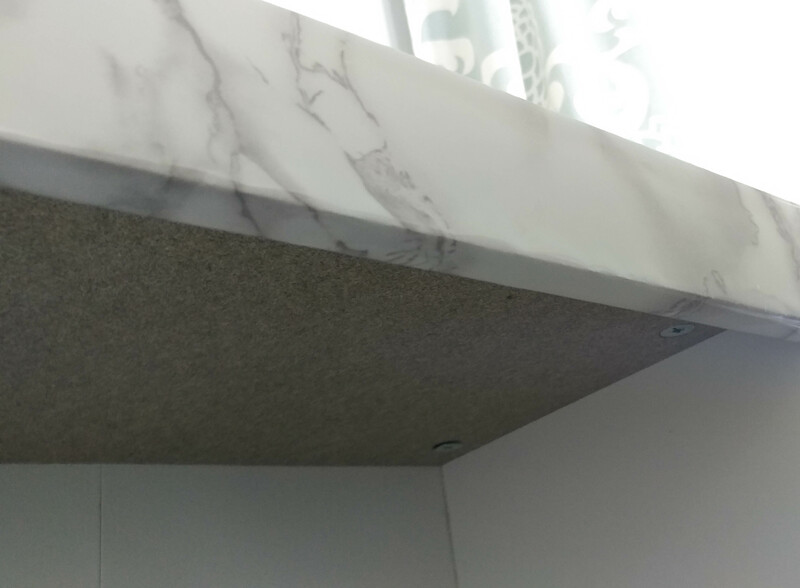 They were wedged in nicely, but this whole cabinet piece can be moved around if need be. 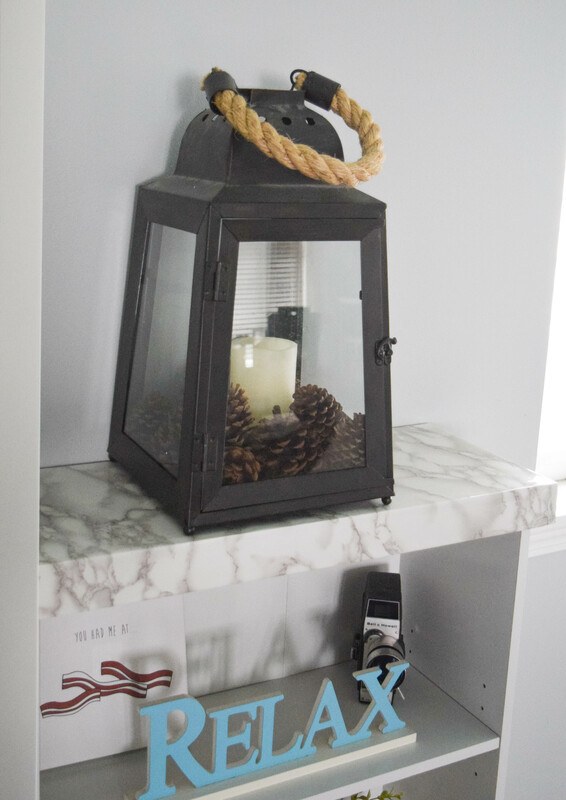 This is a great option if you rent your home to add some pretty details to the home without causing permanent damage. Marble contact paper! I have used this one other time and fell in love with the finished look. 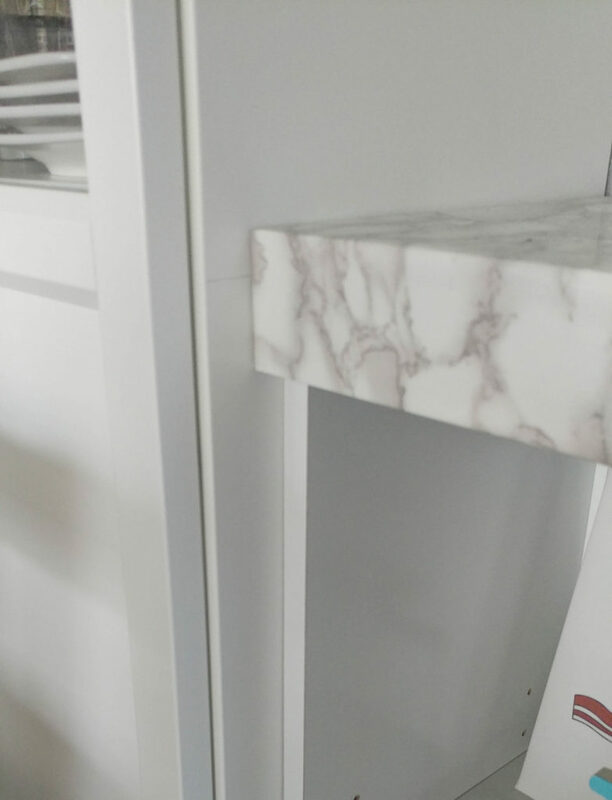 It is smooth and shiny, it even looks and feels like real marble. 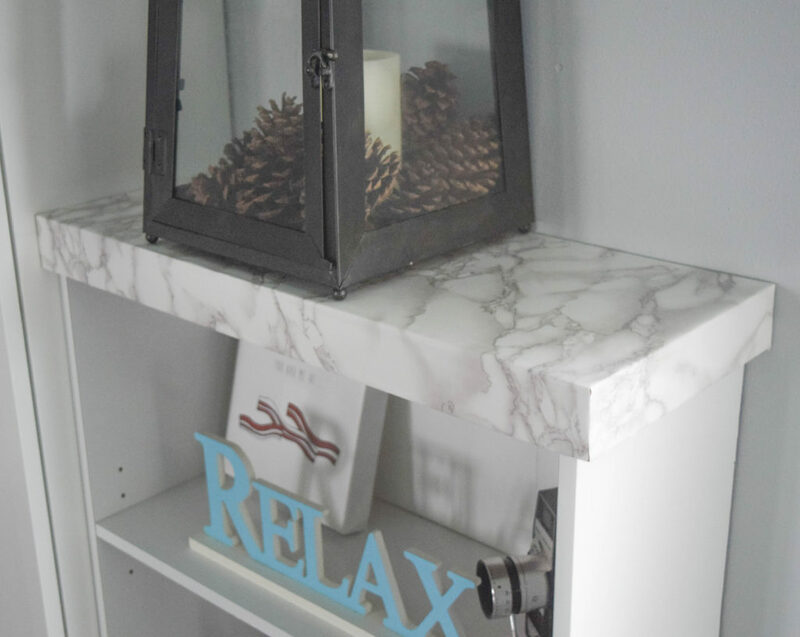 I have multiple people mention my pretty marble top for the cabinet. 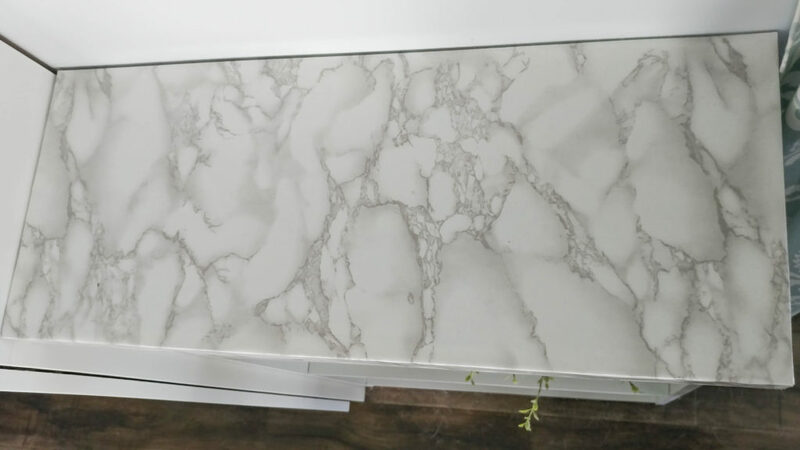 With people seeming to be tricked so easily I am tempted to just lay out the marble contact paper over my current counter tops in the kitchen until we can get the real stuff. Then I remember that we actually use our kitchen and I don’t think this would hold up to much moisture or cutting. I have used the top of these bookshelves when we have people over to set some snacks on, but other than that it is purely for appearance. 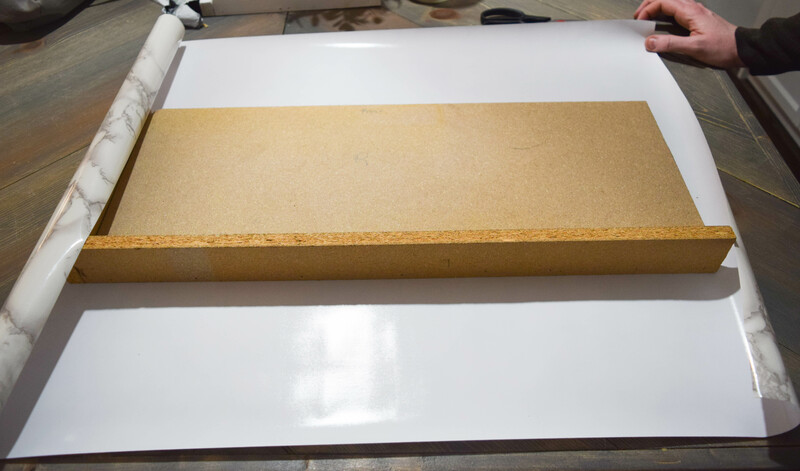 I cut a large portion of the paper, enough to cover the complete surface. Dale and I did this together, in order to get it right with no bubbles or lines I would recommended having help. First is attaching the top portion with marble paper. Peel of the back and then work from one side of the surface to the other. Smoothing it down. Use some kind of smoothing device to push any bubbles out. If you do not have a specific tool for this even a credit card will work. For once using a credit card will not effect your bank account! I turned it back over once the top was all smoothed out. Then cutting around the sides. 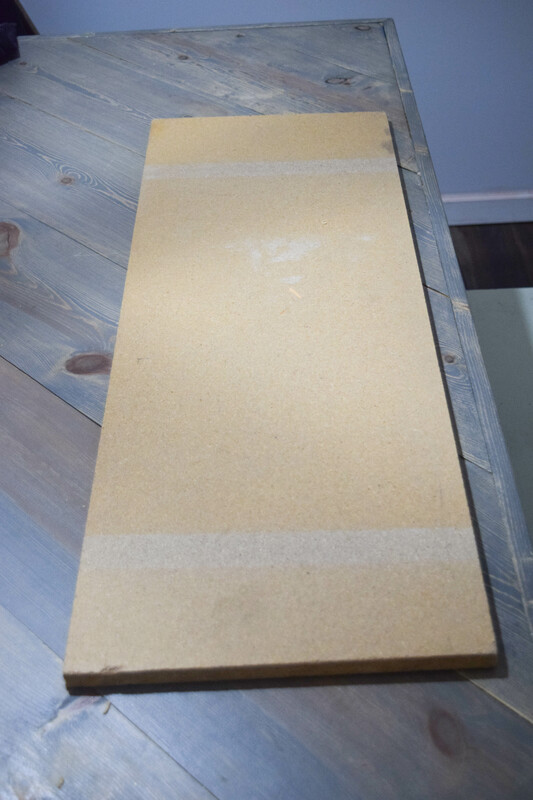 I pulled the paper to wrap under the top piece of board. This will make it look like that lovely marble slab I am going for. It is not too pretty on the bottom, but this is all set on top of the bookshelf, which also has a top so this is not going to be seen at all. Another simple way I customized the cabinet is by changing out the door hardware. 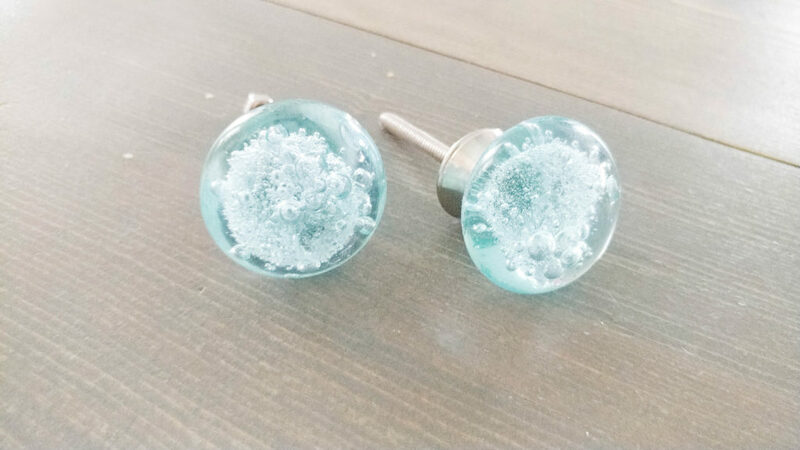 I found these pretty turquoise glass ones and thought they would fit perfectly in my home! 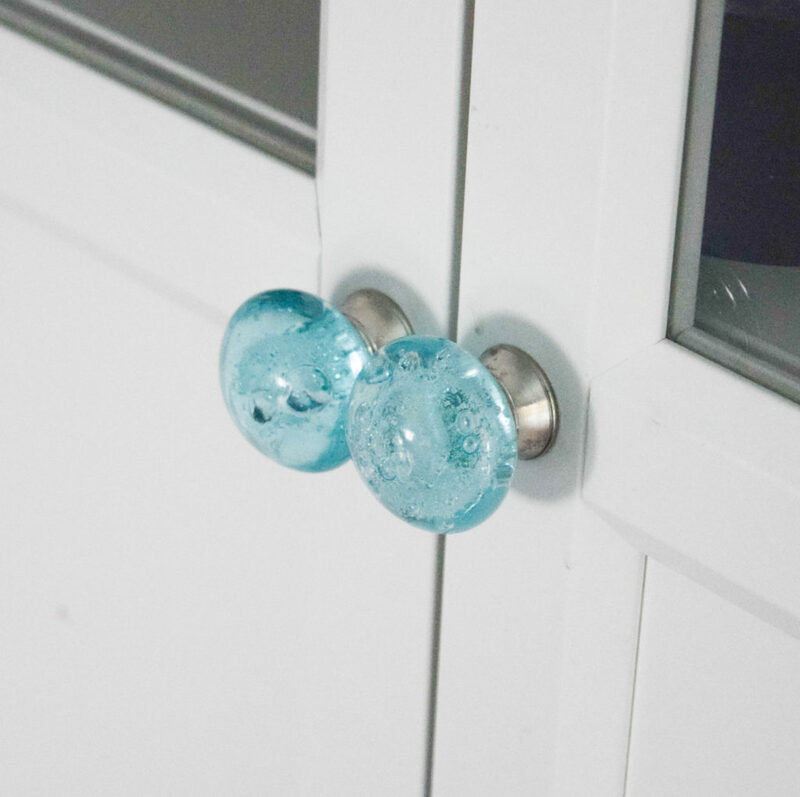 Customizing the hardware in your home is the easiest and best way to change things up. It is done! The easy steps to customize bookshelves for a custom look are done and I have a pretty china cabinet. This is such a low cost option, and gives me beautiful results! 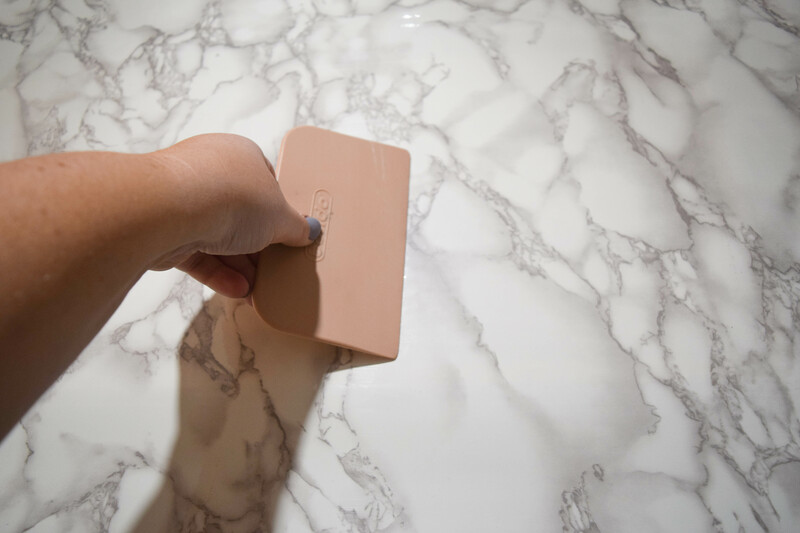 The marble contact paper looks just as good in person. Here is the underside. If you have something that will be seen on the bottom you can simply wrap the complete top with the paper. These cabinets are not 100% done. I plan to add floor trim around these, to give that built in feel to them. I am also going to be adding crown molding to the dining room. Little tweaks to make these feel just a tiny bit more custom. This adds just the right of balance to the dining room that was missing. It also has a ton of storage! I am able to display some pretty smaller decor items, my prettier dishes, and in the closed portion of the cabinet I also have a ton of the kids lunch containers and a few smaller kitchen items. More function in my home, which is always my favorite! I am sure you have noticed I like to add function to my home, I have a big-ish family and we have an average sized home, so making every inch of it function is key. 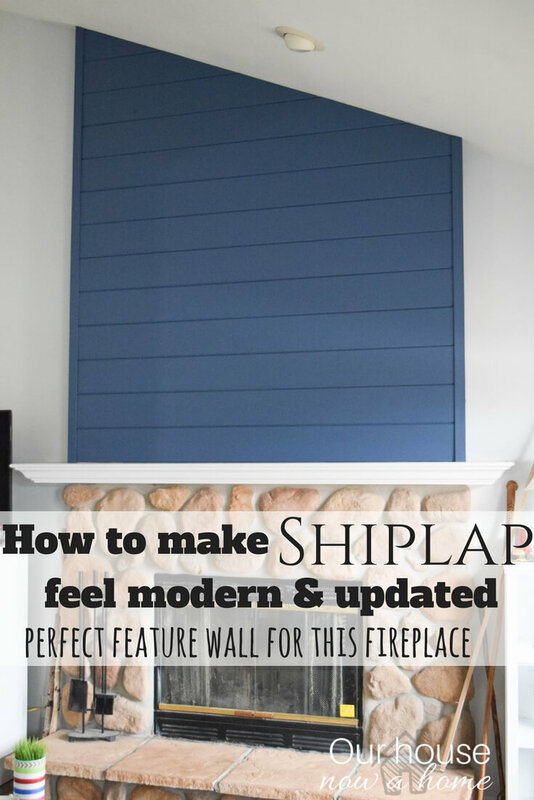 I do this with a lot of DIY ideas, which allows me to customize everything to exactly what I need. 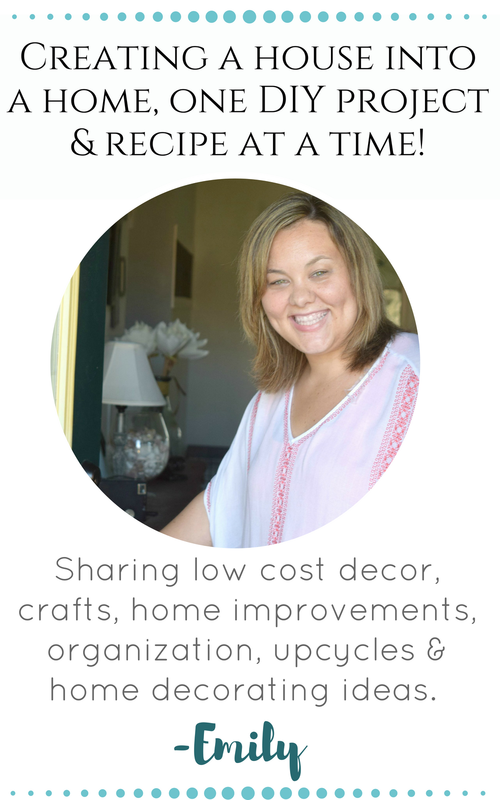 Since I am not just sharing my home for my own benefit here on the blog but for yours too, I wanted to share another great place to go for inspiration. 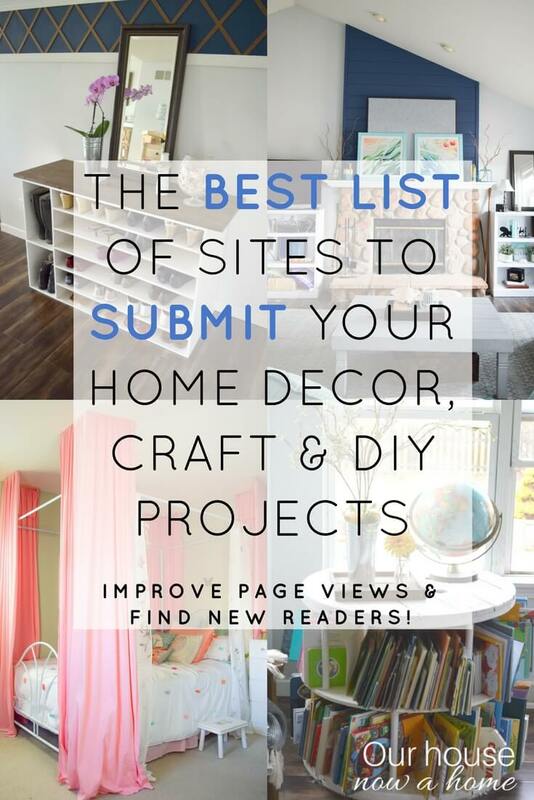 I talked about the DIY idea center in my post from earlier this week about places to submit projects to. 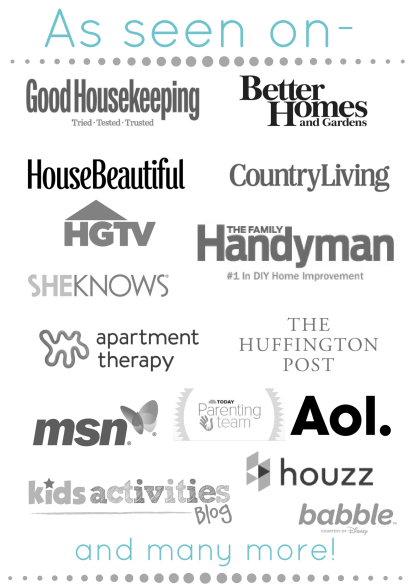 So many people mentioned how not only was the list helpful for feature options but also to get home inspiration. I share my projects here and also enjoy perusing for different ideas. I can only share so many ideas, so like to give even more options to you lovely people. Which is a great option, the more inspiration the better! I added the darker lanterns to this because the cabinet itself with the marble has a very light effect. I like to contrast that with pops of a dark color. I find it warms up a space so much this way. 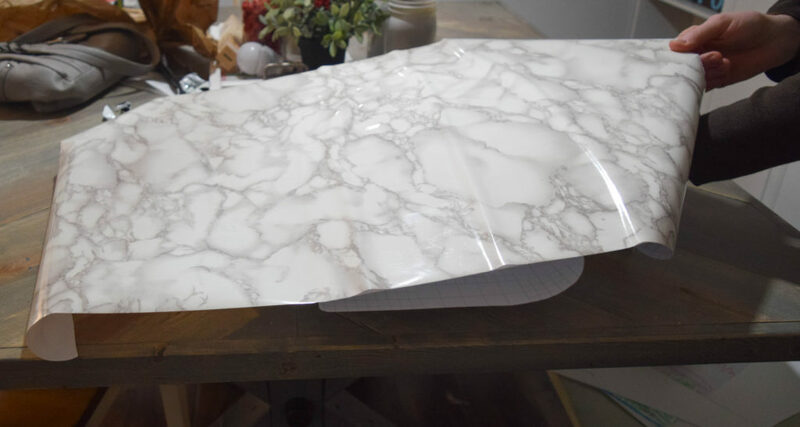 Guys, this marble contact paper is a dream come true! I am having to hold myself back from adding marble touches to everything, it is such a timeless and classic look. 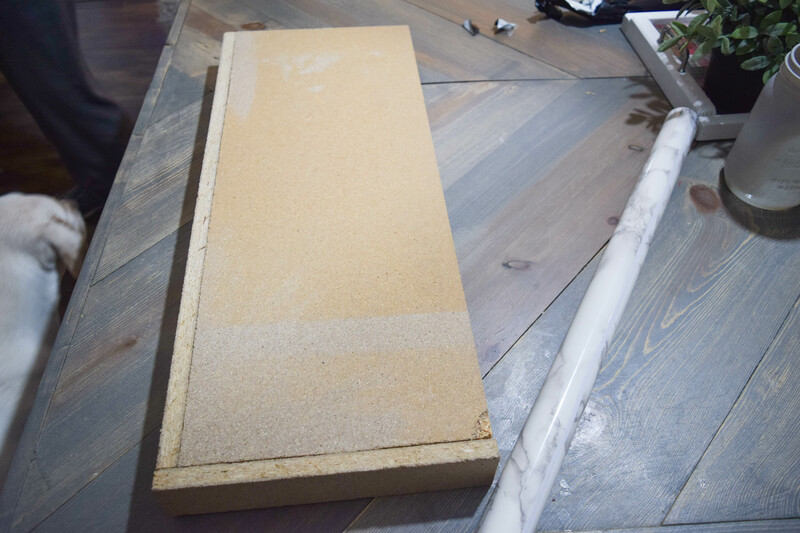 I hope to eventually get real marble in my home, but for now I am faking it until I make it with the marble paper. You do what you gotta do! Even though this dining room has bothered me for years with the awkward layout and furniture not set up right, I am happy it took me so long to get it right. If I had gone full force with this room a few years ago it would not have turned out the way it had. Letting a home settle and evolve before making changes is a good thing. I was able to see how we used the room, what was lacking and what really bothered me. From there I was able to problem solve with those issues. I ended up with the easy steps to customize bookshelves for a custom look and arranging the existing furniture in a way to make the room look and function so much better! Like my home, my family is constantly evolving, and my kids are committed to growing up so dang fast! I am off to celebrate my forever little man and his newly minted 6 year old self. I hope you all have a wonderful weekend, and if you celebrate Easter I hope you enjoy the time with loved ones! That is a brilliant idea. I would never have thought to add doors and marble paper to highlight them. I love this idea so much. Happy 6th birthday to your little man! OMG – I love how you customized those bookshelves. They look so good. I need to hold on to this one so I can duplicate it. Thanks so much! You book case turned out wonderful. Great to take those so plain looking shelves and turn them into something really pretty and useful. Great your daughter was able to help. Time does fly by so enjoy every moment. I really love this idea! The pictures of the kids helping are so cute! Teach them while they’re young! How neat! This is a really great idea, and I need to show it to my husband. We are getting ready to redo our kitchen, and this looks like the perfect project. I really love this idea! It makes the room look a lot more classy than just a plain old bookshelf. I am definitely going to consider doing something like this in our house. Oh wow! I love these! We have tons of books in our house and this is agreat idea on how to store them – and fit it in with your own decor! These are so gorgeous! I love this idea. I need to make one! Wow I am amazed at the creativity and it looks so good. Looks like it was bought that way. As for your baby growing up… no worries….I always tell myself they’ll always be our babies no matter what age. That’s just what I need in my family room. We’ve got a huge wall with nothing on it. No storage included. Love how easy you could personalize & transform the pieces. Those look so good. I love the use of the fancy knobs. I love the old time glass look to those. Great job redoing them! 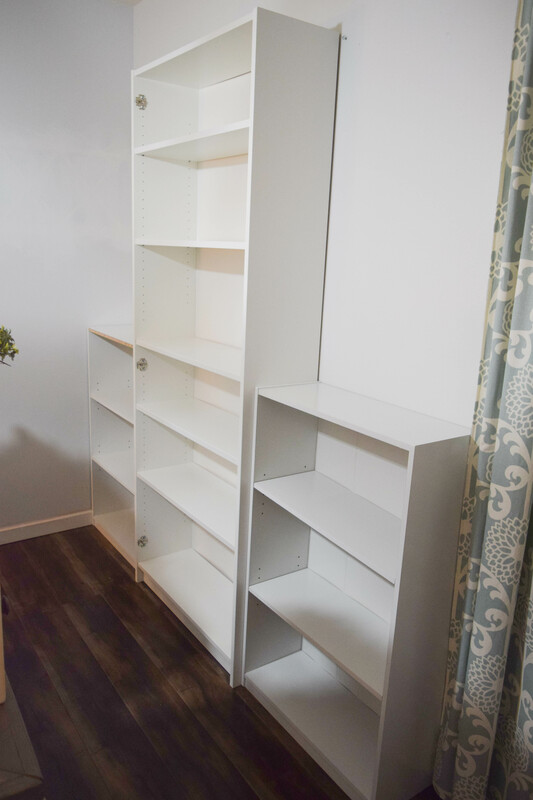 What an easy way to change the look of a bookcase. This really fits with the theme of your house, so creative. Marble contact paper is everything! I love how it can give a sophisticated look without the high ticket price. 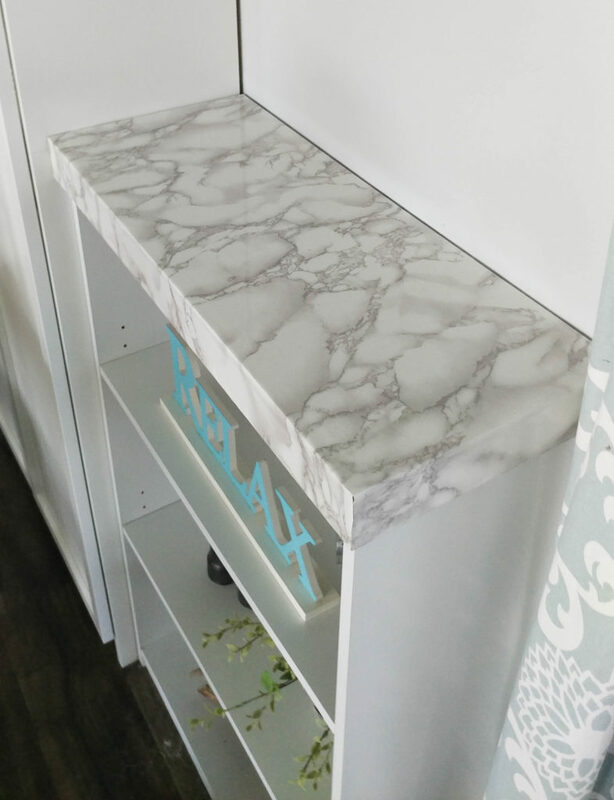 The marble contact paper gives the bookshelves a whole new look! They look great! 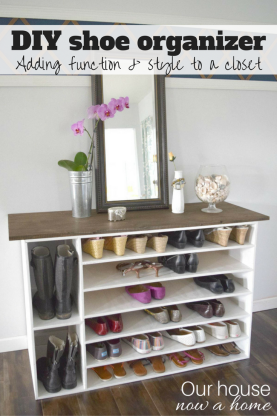 This is a really nice shelving project! 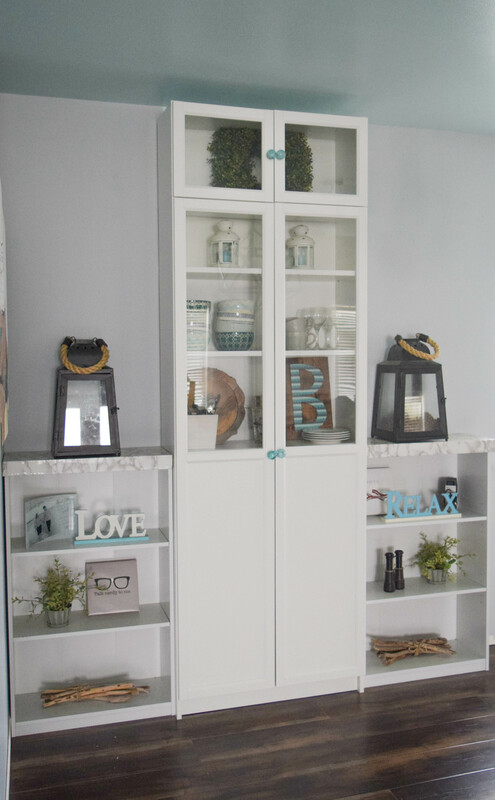 I love the dainty color you chose for it and those cabinet door holders really made an impact. Love the turquoise color! Gorgeous! The marble paper had be fooled which is surprising! Normally I hate imitation paper and/or other items. It works great! I think this is beautifully made. I love how it turned out and the little details definitely make it so much better! This is awesome. That’s a lovely project! It’s been a long time since I made something like this. You’ve inspired me to start a new project at home. I would never have thought of adding multiple bookcases. When we get our new house, I want to do something like this in my kids room. There are some really great ideas here. I should really spice up my decor too. I love how creative you were! It wasn’t extravagant but simple and perfect. 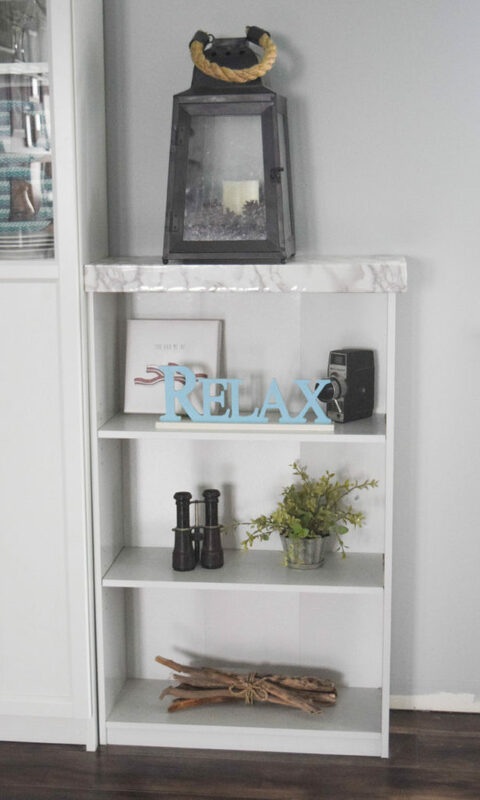 I love how you took simple bookshelves and made them gorgeous! They are perfect! 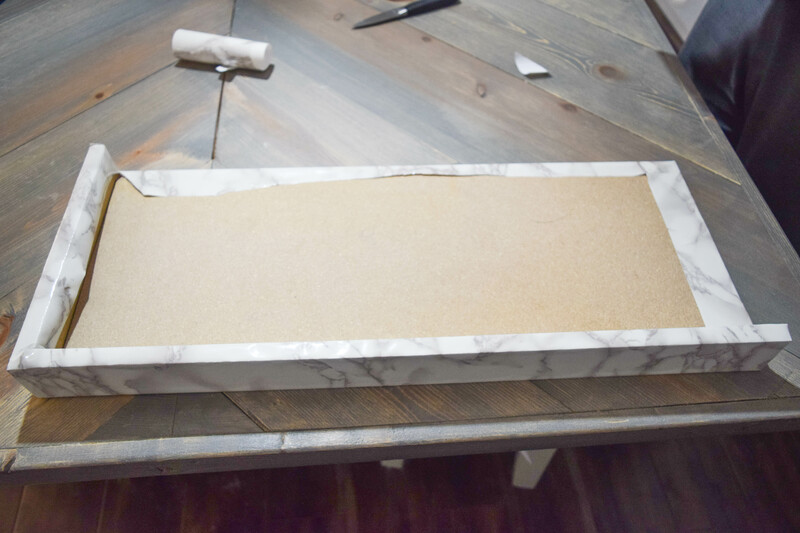 I just bought marble contact paper for some photo props but I really like the idea of customizing our furniture too! Love the way your bookshelves look now! 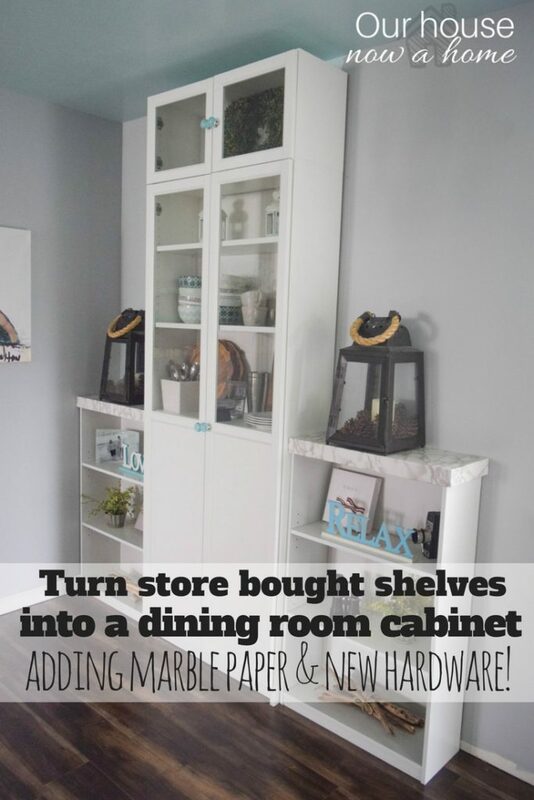 Now this is a great idea and cheaper than buying dining room cabinets. I am going to have to do this for my kitchen. I love the idea of making the tops of the cabinets. Thanks for sharing these awesome ideas. That’s a nice and economical way to reorganize and redecorate your house. This looks so awesome! Such a cheaper idea than actually having the shelves built it! thanks for this idea! 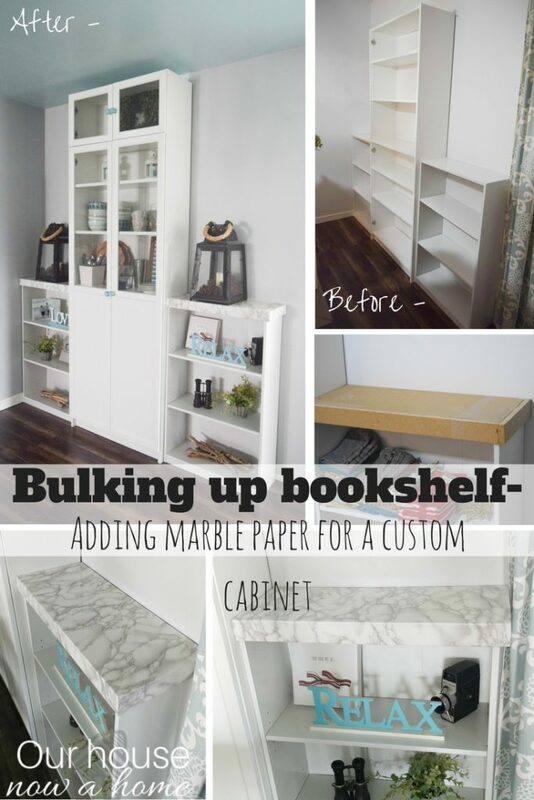 What a fun way to change up the look of an ordinary bookshelf! I love what you did with it. Makes me want to redo the ones we have in our house! I actually have some of this marble vinyl wrap. Great way to use it make it look very chic! 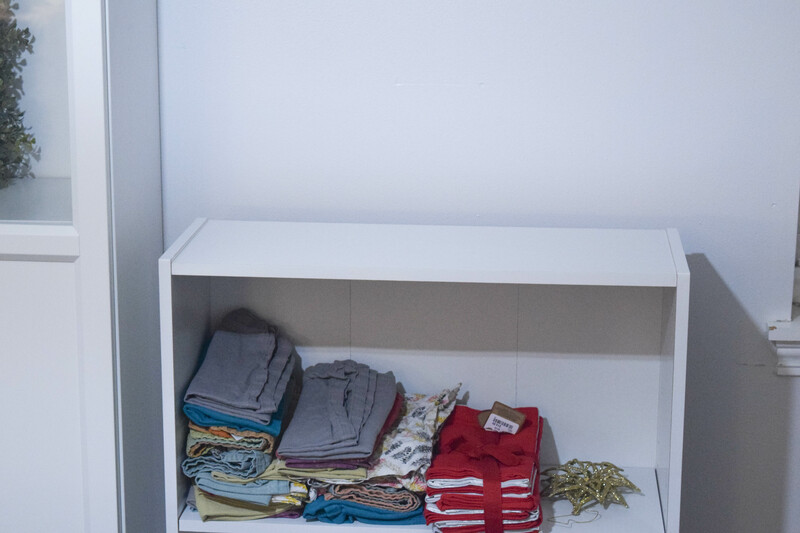 Love how your shelve turned out! All the personal touches make it look great! Looks like the whole family had fun putting it together too. 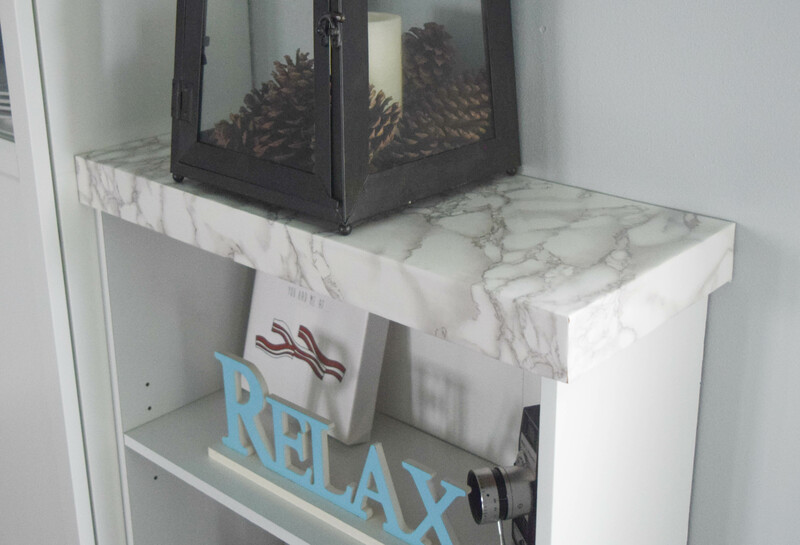 Love the turquoise accents you added, and the marbleized paper is a great idea! Great idea! I love marble look on the top! Oh my goodness, these are so beautiful! I love how you added the doors and the countertop to it! Good gracious, that really makes a nice focal point. 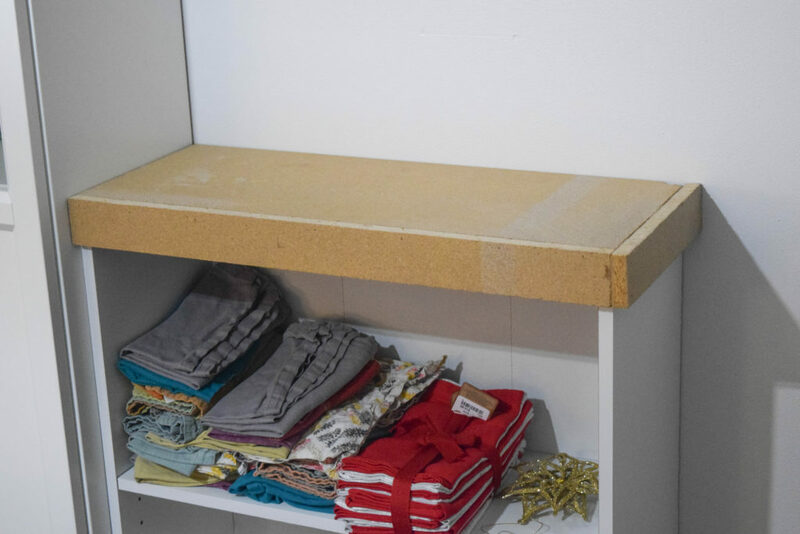 I’ve never thought to do anything like this but I just bought some new shelves and might try something different with them. This is an amazing transformation!! I’m completely obsessed with marble. I love the little touch of details you added with the door knobs! Wow. these are so gorgeous, I wish my husband could do things like this. How lovely is this project! I live for DIY projects like this. It’s so much better than buying overpriced furniture. You can always make something look better with a little change.